"WHAT IS CALIBRATION AND WHY IS IT SO IMPORTANT"
The understanding of behavior process of weighing devices is known as calibration. A weighing instrument can be calibrated without making adjustments. Calibration certificates have passed and failed sections to determine whether a measurement device is working ‘well enough’ with the help of tolerance. Standards weights are defined for particular units as test weight. The relationship between the known value and the measured value helps in understanding the behavior of the weighing instrument. 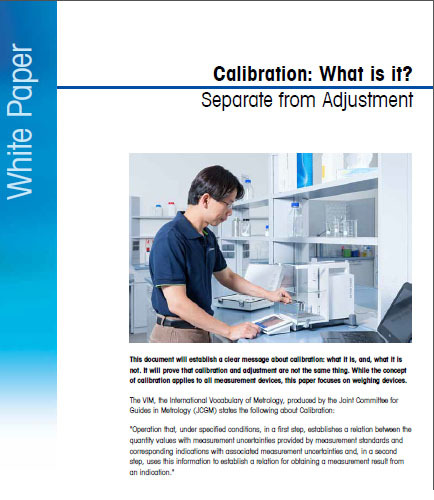 Calibration is not the same as an adjustment. The calibration process can be done without adjustments. Tolerance is gathered from a variety of sources and the correct tolerance does not exist. Measurement uncertainty determines the difference between actual value and the measured value. Calculation of measurement uncertainties helps in determining the minimum weight. The relative measurement uncertainty is smaller than the weighing tolerance requirement during weighing more than the minimum weight. A pipette being the most important of all equipments in a laboratory requires to be well chosen. The pipetting system helps researchers to make informed choices on various equipments for calibration and routine operations. Choosing the right pipette helps in achieving accurate results. Dosing small volumes of liquid into different apparatuses can be tiresome at times, and is practiced on daily basis for research purposes. Thus, it is essential to use high-quality pipettes and controllers for increased level of productivity, and reducing person-hours at laboratories. Read a detailed guideline on Pipetting Systems with the White paper published below to address your concerns: Does your current pipette equipment give results with precision and consuming less time? How does pipetting techniques and use of good quality pipettes made from PVDF polymers enhance your result accuracy? Is the right pipette chosen for conducting the research study? Titration is the method of analyzing the concentration of an unknown substance in a solution with the help of a titrant of known concentration based on the complete chemical reaction that occurs between the unknown substance and the titrant. It is one of the widely used laboratory technique of quantitative chemical analysis in the fields of chemical, electronic, food and beverage industries. The titration theory is determined by the type of the chemical reaction that occurs in the different titration process which is then monitored through a color indicator or potentiometric principle and a distinction between endpoint and equivalence point is made to establish the concentration of the unknown substance. Key takeaways from this white paper: Titration is a well-established analytic technique with higher precision and accuracy. It also provides good price and performance ratio compared to other techniques. Distinct differences between automated titration and manual titration are established. A complete guide for Karl Fisher’s titration process is provided in details. Detailed understanding of titration components and process.